In France, two people were killed when a light aircraft crashed into a field in the northeastern part of the country yesterday. Strasbourg Council said the accident happened shortly after the plane took off from a strip 70 kilometres from the city of Metz in the Moselle region. For a reason not yet determined the plane turned at a right-angle, crashed into a field and immediately burst into flames. An air transport police enquiry has been set up to determine the cause of the crash. Leave a commentEdit"Two killed in aircraft crash in France"
A portion of road caved in on Chennai’s Anna Salai, also known as Mount Road, on Sunday, pulling down a bus and a car. Initial reports suggest that around 35 people were inside the bus, and sustained minor injuries. Some of them were taken to the Royapettah Government Hospital. 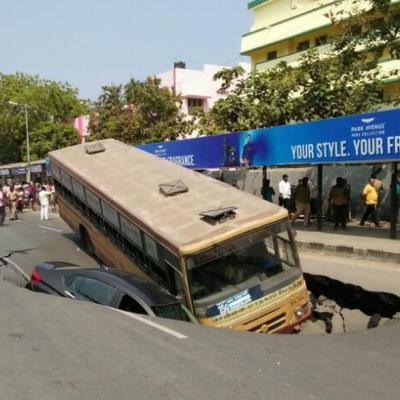 A bus and a car plunged into a huge crater that was formed in the middle of Chennai’s busy Anna Salai, also known as Mount Road on Sunday. It is suspected that the crater must have been formed because of the metro rail work. Since it was a Sunday, there was very less traffic on the road. The cave-in occurred due to tunnel boring work for the Chennai Metro rail that is being carried out between Thousand Lights and AG- DMS. This is the second such road cave-in on Anna Salai in ten days. Police have cordoned off the stretch from White’s Road turning to the foot of the flyover on Anna Salai. Leave a commentEdit"Road caves in on Anna Salai in Chennai"
Nearly 21 people have been killed and dozens more injured in an explosion at a church in northern Egypt. State media say, the blast targeted St George’s Coptic church in the city of Tanta in the Nile Delta. The cause of the explosion is not yet known, but Egypt’s Christian minority has often been targeted by Islamist militants in recent years. It was timed for maximum impact, as people gathered to mark Palm Sunday. Egyptian security forces had been put on alert in anticipation of such an attack. Provincial Governor Ahmad Deif told the state-run Nile channel that either a bomb was planted or someone blew himself up. A search is under way for any more explosives which could be in the vicinity. Leave a commentEdit"21 people killed, dozens injured in explosion at church in Egypt"
Venezuela cities are pouring with anti-President Nicolas Maduro gathering in various cities and into the streets of Caracas for continuing protest as mass movement that shows no sign of retreat. This long demonstrations in the capital and several other cities are of the result after Maduro’s government banned top opposition leader Henrique Capriles from running for office for 15 years. The opposition controls 2/3 of Venezuela’s National Assembly since December 2015. (The December 2016 local elections were cancelled and the presidential referendum denied.) Last week, on March 30th, the Venezuelan Supreme Court effectively staged a coup in favor of the regime (autogolpe, in Spanish) by stripping the National Assembly’s legislative power. The outrage over the Supreme Court’s autogolpe was swift and unequivocal domestically, with international condemnation. Peru immediately pulled its ambassador indefinitely. A day later, the Supreme Court (such as it is: there are rumors such decisions are written by one magistrate from within the presidential palace) reversed its decision, but kept powers that are alleged to have sparked the coup in the first place: to sign oil joint venture and financing agreements. That Venezuela is short on money is certainly no secret. In retaliation for the coup, and regardless of the Supreme Court’s reversal, the opposition-controlled National Assembly announced that it will work to remove the Supreme Court justices. In response, President Nicolás Maduro made vague promises of elections in 2018. But at this point, that is well too far away for hungry Venezuelans. Today, protesters took more direct action against the Supreme Court and firebombed it. The political division and cycle of revenge continues to grow. Since yesterday the Maduro regime used some arcane technicality to “disqualify” the opposition presidential candidate Henrique Capriles Radonski, today, the headquarters of his political party, Primero Justicia, was bombed. Sources in Caracas say it was by colectivos, gangs who were armed by the government to be their proxies and some DC analysts say have been trained by the Basij of Iran, with whom the Venezuelan regime has a very close relationship. The colectivos, however, are not always on the side of the government: they have assassinated some government apparatchiks in internecine skirmishes when their interests have diverged. Sources say today’s attack on the opposition leader’s headquarters was likely a hand grenade. “It’s what they carry,” said a local. Reuters’ reporting on yesterday’s disqualification of Capriles is very wrong on a key point: it says Capriles is was “the best hope” of the opposition. False. For years, the rest of the opposition groups have thought Capriles is in the pocket of the regime: conceded his April 2013 electoral loss far too easily, when so many people considered it stolen; too eager to promote dialogue, when so many consider it a ploy for time for a regime that has no desire to grant any democracy. Capriles had to step up and support the protests of two days ago (April 6th), because everyone else did; he did not lead it. In effect, Capriles has been dragged along by a radicalized opposition. Two women are emerging: from the party Voluntad Popular, Lilian Tintori, whose imprisoned husband, Leopoldo López, really would win any election, and Maria Corina Machado, who leads Vente Venezuela. While Tintori has been coming and going from DC, meeting with the Trump administration and members of the US Congress, as well as the Pope and various Latin American heads of state, Machado has been barred from leaving Venezuela (even to visit her children) for years. While Tintori has built the international coalition of support, Machado (a distant cousin of mine by marriage) has coalesced the domestic forces for change. When change finally does come to Venezuela, it will be a woman in charge. Leave a commentEdit"Venezuelans on street protests"
Astronomers, using NASA’s Kepler space telescope, have discovered a Venus-like planet. Isabel Angelo, a scientist at SETI Institute, research organisation in the US said the plant is orbitting a dim star that is one-fifth the diameter of Sun and is located 219 light-years away from Earth. This newly found world is only slightly larger than Earth, and it tightly embraces its low-temperature star called Kepler-1649, encircling it every nine days. The tight orbit causes the flux of sunlight reaching the planet to be 2.3 times as great as the solar flux on Earth. For comparison, the solar flux on Venus is 1.9 times the terrestrial value. The discovery will provide insight into the nature of planets around M dwarf stars, by far the most common type in the universe. Leave a commentEdit"NASA’s Kepler space telescope discoveres Venus-like planet"
KIMI and Korea Trade Promotion Industry Cooperative are organizing BUTECH 2017 – an International Machinery Fair Bus from 24th to 27th May 2017 at BEXCO (Busan Exhibition and Convention Center), Busan, South Korea. We are pleased to inform you that we are organizing a Business Delegation Visit to BUTECH 2017. The Organizers, who are extending invitations to Indian industry leaders to visit the Fair. The visitors selected by the Organizers will be offered to and fro economy class air-ticket for Mumbai-Busan-Mumbai Sector and 3 days hotel stay at Busan. We are charging processing fee of Rs. 20,000/- (+ applicable taxes) per delegate and the same is refundable in case the delegate is not selected by the Organizers. BUTECH representing the strength of the Korean and Asian industry is aiming to create productive business trade fair environment for the benefit of both the exhibitors and the visitors with FairAct assisting the Organizers to fulfill their objectives. We request you to kindly fill the application form and send the same to us with necessary documents and cheque for Rs. 23,000/- (Rs. 20,000/- + 15% Service Tax) drawn in favour of ‘FairAct Exhibitions and Events LLP’ at your earliest convenience but preferably before 25thApril 2017 to enable us to process your application so that approvals are obtained and travel and stay formalities can be completed in time. We are pleased to present findings from our research project on “The Political Economy of Land Rights and Federalism in the Fifth and Sixth Schedule Areas: Andhra Pradesh, Telangana, Gujarat and Meghalaya“, which is a research collaboration between the Centre for Policy Research Land Rights Initiative (“CPR-LRI“) and the Centre on Law and Social Transformation (“LawTransform“), as well as comments by various experts and stakeholders on these findings during our conference on “Land Rights, Land Acquisition, and Inclusive Development in India”, held on March 2 and 3, 2017. This begs the question as to why despite the existence of special constitutional and legal provisions for safeguarding the rights of tribals to land and also special affirmative action provisions for the STs, they continue to remain the most displaced, most vulnerable, and most impoverished of all groups in India. Through archival and field research in the states of Gujarat, Andhra Pradesh and Telangana, the CPR-LRI team presents some key findings in response to this question. No data existed on the extent of geographical area in the Scheduled Areas. Based on extensive Census 2011 village and district level mapping of data, the Initiative has determined that 10.5% of all India’s geographical area lies within the Scheduled Areas. 1. Panel Discussion on “The Political Economy of Land Rights in the Scheduled Areas“. This session was chaired by Mr. Deepak Sanan, former Additional Chief Secretary, Government of Himachal Pradesh, and featured comments on the first presentation by Mr. Walter Fernandes, Senior Fellow (Professor), Northeastern Research Centre, Guwahati, Professor Nandini Sundar, Delhi School of Economics, Mr. Ravi Rebbapragada, Executive Director, Samata, and Mr. Ambrish Mehta, ARCH Vahini. 2. Panel Discussion on “Federalism and the Fifth and Sixth Schedules to the Constitution“. This session was chaired by Professor Siri Gloppen, Director, Centre on Law and Social Transformation, and featured comments on the second presentation by Mr. Walter Fernandes, Senior Fellow ((Professor), Northeastern Research Centre, Guwahati, Ms. Patricia Mukhim, Editor, Shillong Times, Dr. VNVK Sastry, Social Anthropologist and Senior Consultant and former Director of the Tribal Cultural Research and Training Institute, Hyderabad, Mr. Ambrish Mehta, Trustee, ARCH-Vahini and Mr. Sagar Rabari, Jamin Adhikar Aandolan Gujarat. Please do not hesitate to contact us if you need any further information. Your feedback on our research is much appreciated. Leave a commentEdit"CPR Land Rights Initiative"
This week, in a devastating attack against Syrian civilians, President Bashar al-Assad broke with the international prohibition against chemical weapons and killed over 70 men, women, and children with Sarin gas. Assad’s attack is not an isolated incident; his regime has waged warfare against the Syrian people for more than six years, killing hundreds of thousands of civilians in the process. The war in Syria is an international crisis that requires a comprehensive strategy to finally end. That’s why we’re calling on President Trump to work with the international community to immediately address the human rights abuses perpetrated against civilians by the Assad regime and by ISIS, and advance an end to the conflict. And if we truly want to protect innocent Syrians, we cannot turn our back on the millions of refugees desperately fleeing the fighting. Many of those we’ve shut our doors on are victims of vicious attacks like those carried out by the Assad regime this week. Join us in calling on the Trump Administration to renew strong and sustained diplomatic efforts to find a solution to the crisis, and to welcome those fleeing the war’s horrors. Leave a commentEdit"This week devastating attack in Syria"
In the backdrop of several initiatives by the Government of India to promote affordable housing for Economically Weaker Sections, Low and Middle Income Groups including sanction of ‘infrastructure status’ for this segment, CREDAI (Confederation of Real Estate Developers’ Associations of India) today launched 352 projects in 53 cities in 17 States across the country with an investment of Rs.38,003 cr to build 2,03,851 affordable houses. These housing projects to be taken up the members of CREDAI across the country in the first major private investments into affordable housing were today launched by the Minister of Housing & Urban Poverty Alleviation Shri M.Venkaiah Naidu at Gandhinagar. Ministry of HUPA has so far approved construction of 17,73,052 affordable houses under Prime Minister’s Awas Yojana (Urban) with an investment of Rs.95,660 cr in 30 States and Union Territories. These approved projects are to be executed with assistance from central and state governments and beneficiary contribution under the four components of PMAY (Urban). Under this urban housing mission, central assistance in the range of Rs.1.00 lakh to Rs.2.35 lakh will be provided to each beneficiary. PMAY (Urban) was launched by Prime Minister Shri Narendra Modi on June 25, 2015. The Government of India on December 31, 2017 extended the Credit Linked Subsidy Scheme component of PMAY (Urban) to Middle Income Groups with annual incomes in the range of Rs.12 lakh to Rs.18 lakh under which interest subsidy of 4% and 3% on housing loans will be provided. With this, beneficiaries belonging to EWS, LIG and MIG with annual incomes up to Rs.18 lakh have been brought under the ambit of PMAY (Urban) opening up substantial investment opportunities for developers both at the bottom and middle of the pyramid. Speaking on the occasion, Shri Venkaiah Naidu complimented CREDAI and its members for coming forward to invest in affordable housing projects and assured them that his Ministry and Central Nodal Agencies like the National Housing Bank and HUDCO will extend full cooperation in reaching the benefits prescribed under PMAY (Urban) to the beneficiaries who join the projects launched today. As per the details furnished by CREDAI, the cost of construction of these affordable houses will be in the range of Rs.15 lakh to Rs.30 lakh with average cost of construction coming to Rs.18 lakh per house. Gujarat CM Shri Vijay Rupani, Gujarat Deputy CM Shri Nitinbhai Patel, Minister of Urban Development Shri Shankar Chaudhary, Governmet of Gujarat outgoing President of CREDAI Shri Gitambar Anand, New CREDAI president Shri Jaxay Shah andmore than 3000 delegates from across the country attended the CREDAI Investiture Ceremony at Gandhinagar. Leave a commentEdit"First large scale private investment in affordable housing"